With it turning increasingly grey and cold outside, I've decided to turn to my attention some music of the same intensity. 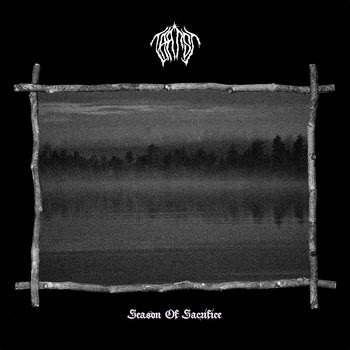 This is the debut two track demo from Finnish black metal band Taatsi. The band wants to stay anonymous, so there isn't very much about them anywhere. Their tape is being re-released by Forever Plagued Records in May/June and Taatsi have recently released an album called Amidst The Trees. Beyond that, I am completely in the dark about the band. I'll allow their tape to do the talking. According to the band’s recently created Facebook page, they have been involved in the black metal scene for over twenty years. To me, that just deepens the mystery that surrounds this band. Season of Sacrifice is filled with cold black metal that is peppered with folk instruments, which add atmosphere. The song is mid-paced but has plenty of momentum and instead of attacking you with brutal blasts, Taatsi instead choose a more measured approach. Cult of The Northstar features more of the band’s acoustic guitar that I’ve been reading about. It creates a nice intro to the song. The orchestral ambience within the song is very majestic. It adds a layer of warmth that would otherwise be hidden by those icy growls. As demo’s go, this is a good introduction to Taatsi, though short. If you can track a tape copy down, along with their album Amidst The Trees (although I’m not sure if it’s been physically released yet), their folk-tinged black metal should keep you more than content for a long while. You can buy a copy of the recently released tape version from Forever Plagued Records here - https://www.foreverplaguedrecords.com.